Who? What? Where? When? Why? These are the five types of WH-Questions that we have memorized over and over again throughout our lives. Many of my students, however, have difficulty discriminating between the different types of questions as well as answering them. There are many worksheets, question lists, and products out there to help children work on WH questions, but only a few applications that address this topic. Super Duper Publications has recently taken their WH Question cards to a whole new level. 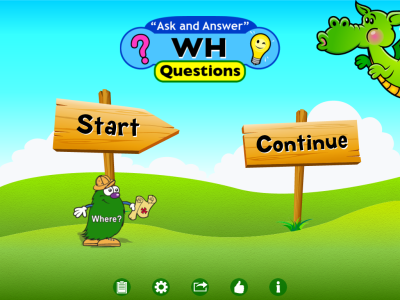 In their first all-inclusive interactive application, there are multiple ways to practice WH questions. To find out more about the WH Questions Pro application, continue reading. The Main Page of this application has two different options to begin application play. You can start a new session or continue a previous session that was not ended within the app. In addition, there are icons to advance to the Results page, Settings, social media links, report a bug/offer a suggestion/review the application, or to view additional information about the application. Pressing the "i" button will bring you to more information about the application including how to use the application, its features, credits, and security information. You can e-mail or message information to your friends about the application as well as follow Super Duper Publications on Facebook or Twitter by pressing the square button with an arrow in it. Press the "thumbs up" button to report a bug or offer a suggestion to Super Duper Publications about the application. You can also review the application in iTunes. Auto-Advance: turn on/off auto advancing of players and/or cards using the on/off switches. Reading: use the on/off switches to determine whether or not to have the application auto read each card or require a full read-through. Sound: turn on/off sound effects and adjust how loud the sound effects will be. 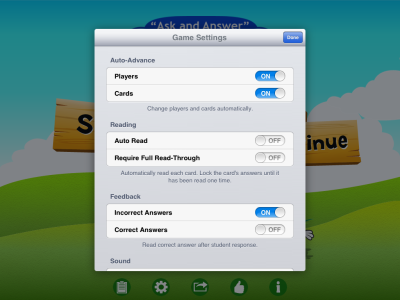 Multiple Choice Game Options: turn on/off open-ended responses for the multiple choice game to either show multiple answer choices or score responses manually. Matching Game Options: turn on/off easy mode to leave all cards flipped over during the game or not. Press the "Start" button to access the "Start a New Game" menu. Then, select the card decks to use by highlighting them. When highlighted, it will show the amount of questions that will be used at the bottom. Otherwise it will show 0/28. There are 28 total pairs of cards (28 questions/28 answers) for each of five decks - who, what, where, when, and why. Press on the blue arrow button at the bottom right hand corner of any deck of cards to select which questions/answers will be used. 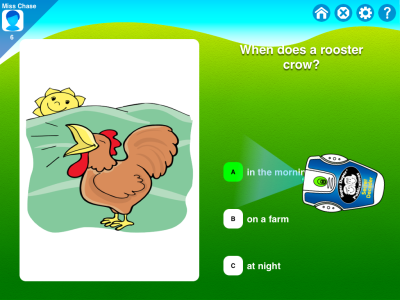 Pressing on the question or answer will highlight it to be used in application play. One can select all or deselect all questions/answers. Once you have selected which question types and questions to use, press "Done". Next, you must choose the player(s) to use the application. To add a new player, press the person with a "+" button, then press the "+" button next to "Select Player". Type in the users' name and press "Save". They will then be added to the list. If you already have users added to the players list, select them by pressing the person "+" button, then choosing their name from the list. To delete a player, press the person "+" button, then swipe right to left on the player's name to cause the "Delete" button to appear. Press it, then press "Yes" on the pop-up window. Whomever recently played the application will appear for the following session, so make sure that you press the "-" button by the group of people to clear them from gameplay and to select new players. Multiple Choice - Pressing on the Multiple Choice game to choose whether to practice answering or asking questions. When asking or answering questions, if the open-ended questions setting is turned off, you have the ability to choose between three questions or answers. If the open-ended questions setting is turned on, students will have to state their question/answer that matches the card and the speech-language pathologist will be required to mark if the student was correct or incorrect. 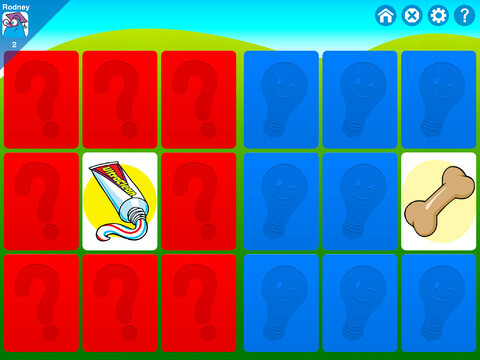 Decoder - Choosing the Decoder game will show a question along with an image including three possible answers. The user must press on the appropriate answer to the question, then press, hold, and drag the decoder over the answer to view whether it was correct or incorrect. Matching - After pressing the Matching button, you can choose between 4, 9, 16, or 25 pairs of cards to match. Questions are on one side and answers are on the other. Press on a card to have it flipped over (unless Easy Mode is turned on in the Settings menu; then all of the cards will be shown at all times) on one side of the application and another on the other side (red/blue). The user then decides if the question card and the answer card match at the top of the application. If the cards match, they will disappear from the sets. At the end of the game, you can choose to play again, start a new game, or go home. 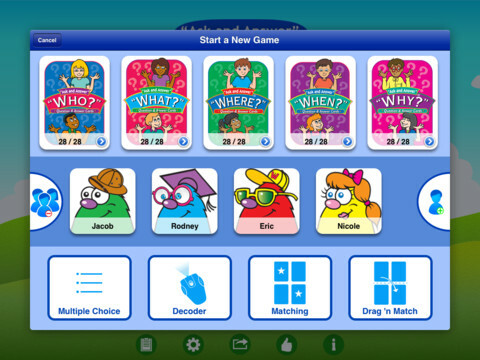 Drag 'n Match - Once you have pressed the Drag 'n Match game, you can choose between 1-4 questions to match. Question and answer cards will show. The user must press, hold, and drag the matching cards to each other. If correct, a new set of cards will appear. In each of the games, there are four buttons in the top, right hand corner of the screen. Pressing the "Home" button will bring the user to the Main Page of the application. The "x" button will end the game being played and the "Gear" button will allow you to adjust settings during application play. Finally, the "?" button will show the user how to play each activity. 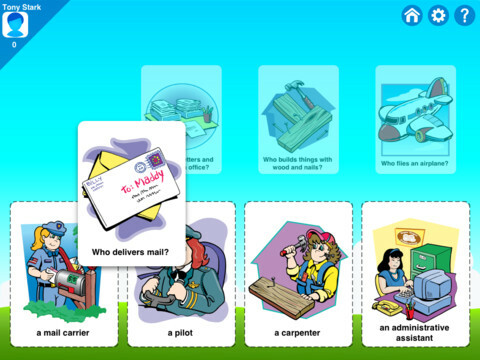 In all four activities, you can press on the card to hear the question and answers. Press on the clipboard button on the Main Page of the application to view the results of the students whom have used the application. Players and Games are listed on the left hand side of the page. Press on a player or game to highlight and choose the player/game you wish to view. If you choose to view based on the player, you can view his or her average percentage correct on the "Player Snapshot" graph over all games played. You must press in the right hand corner the average you would like to view over a certain number of days (recent, last 7 days, last 30 days, last 60 days, last 90 days, or custom (chosen via date wheels)). Games for the particular user are shown at the bottom of the application in order from most recent to oldest. Press on a game to view the students' correct and incorrect responses for each question. If you choose to view based on games played, you will see the users' name(s) who played the game, the date, the time, and the users' score(s). 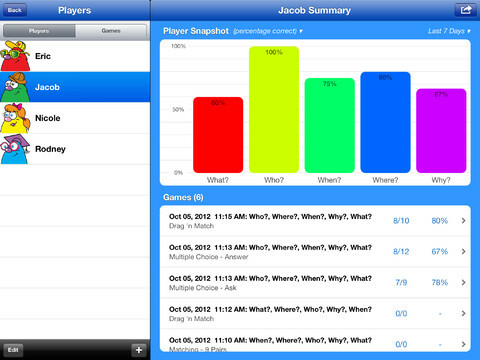 The "Game Snapshot" will show the overall percentage correct for each student. If you want to see more specific information for a student, press on his or her name in the "Students" area at the bottom of the application. Finally, if you wish to share a students' scores, press the square button with the arrow in the middle of it at the top of the page. You can then choose to e-mail, print, or open the information in a separate application. You can delete games/users by swiping from right to left over the game/user name on the list and pressing the "Delete" button or pressing "Edit" followed by the red circle button next to the users' name. I honestly cannot believe how many options, how many ways to practice questions are offered, and how much information one can get out of this application! There are five different decks of cards with 28 cards per deck which you can work on all types of WH questions at once, one at a time, or a couple at once. You can use the application with multiple users at a time. There are four different games available to practice WH questions. Users can work on asking or answering questions. There is data tracking within the application with a graph function. Settings are adjustable and there are multiple settings as well. You can choose to have open-ended responses. The application can read questions and answers to students if they have difficulty reading/have not learned how to read on their own. Sometimes I forget to remove students from the list of who to start a new game with each time I play and end up with additional players. It would be great if you had to choose the students each time you start a new game from scratch. Articulation/Fluency/Voice - Have students read the questions and answers aloud using age-appropriate speech sounds, fluency strategies, and vocal strategies. Expressive Language - Choose the "Ask" option on the Multiple Choice game or adjust the settings for questions to be "Open-Ended" to have students practice their expressive language skills when asking/answering questions. WH Questions - This question is all about having children answer WH Questions. 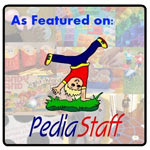 Choose a deck and game, as well as settings, based on each students' needs. Receptive Language - Children can learn about different vocabulary, jobs, places, daily activities, and more from this application. Memory Skills - Play the "Matching" game to have students recall where a question on one side and an answer on the other side are located. 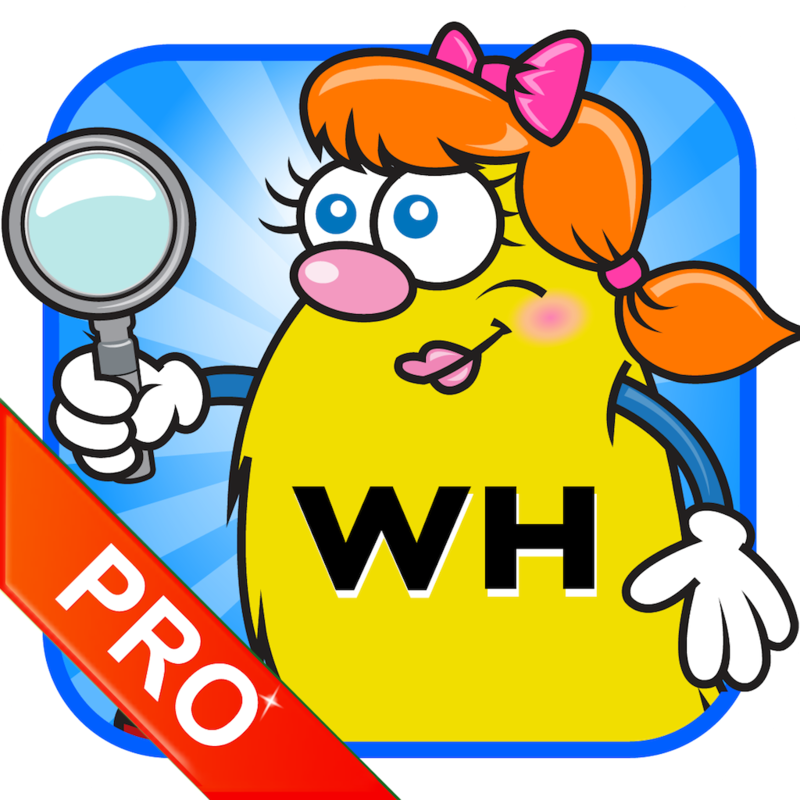 WH Question Cards - Pro is available for the iPad for $11.99. 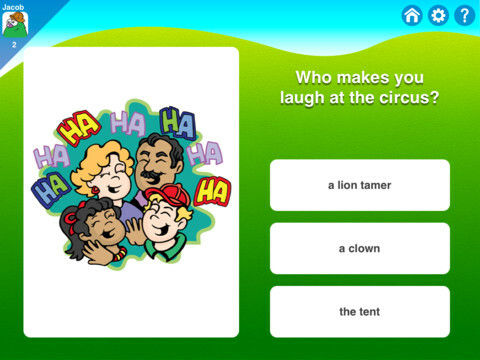 You can download the WH Question Cards app to give it a try before purchasing the Pro version for free. 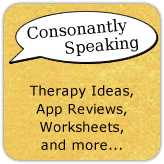 Consonantly Speaking was given a copy of the application from Super Duper Publications to review. No other form of compensation was received.